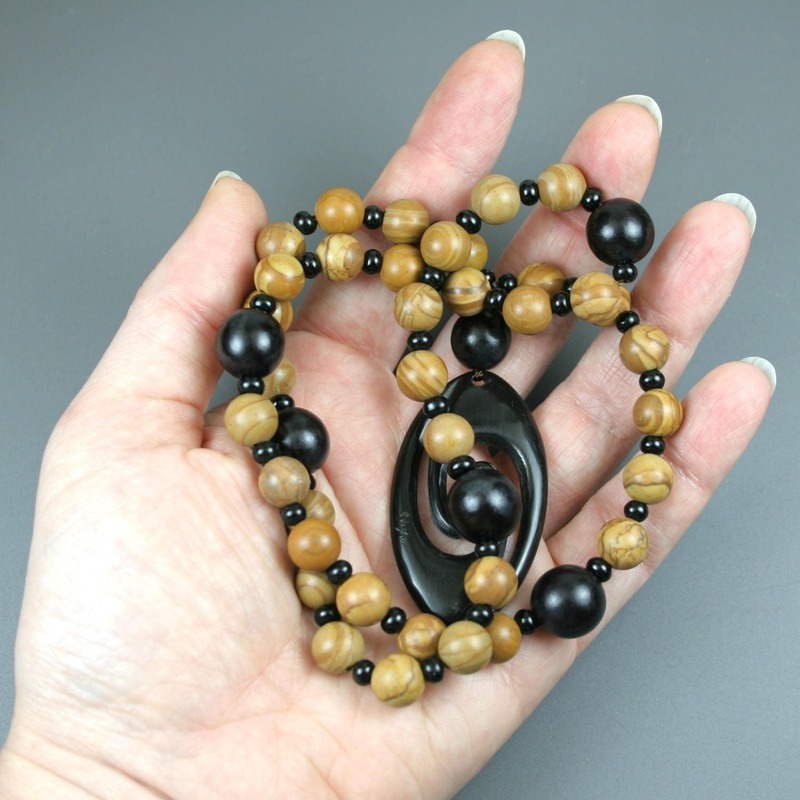 This set of gratitude beads is made in the 36-bead style with the gratitude beads being 8 mm round tiger jasper beads, the category beads being 12 mm round buri root beads, the spacer beads being 3 mm black glass beads, and the opening focal a carved double spiral in an oval made from dark brown horn. These are all strung on nylon cord for a soft flexibility in using the beads coupled with resistance to wear against the rough inner surface of the stones. All knots are reinforced with glue for extra sturdiness. The bead set measures approximately 13 inches long from the end of the opening focal to the top of the circle of beads. * Use the opening focal as a place to slow down, center yourself, and prepare for your gratitude practice. * For each of the six gratitude beads in that category, name one thing (or person) from the category for which you are grateful. * Repeat this process for each set of 1 large and 6 smaller beads in the set. 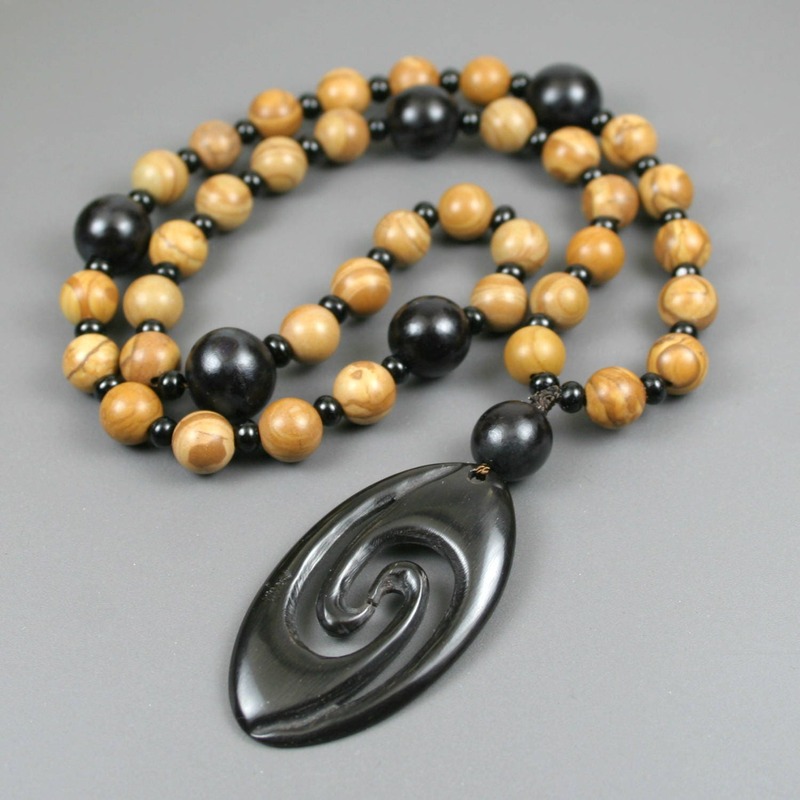 * When you return to the first category bead, you may choose to go around the loop again (three times around is a total of 108 gratitude items named, as in a mala) or you may move back to the opening focal to rest in gratitude for your many blessings. Tiger (or tigerskin) "jasper" is the trade name for a kind of limestone with opaque, rich brown tones of contrasting bands against medium to darker golden base. The lines are created by iron oxide deposits. 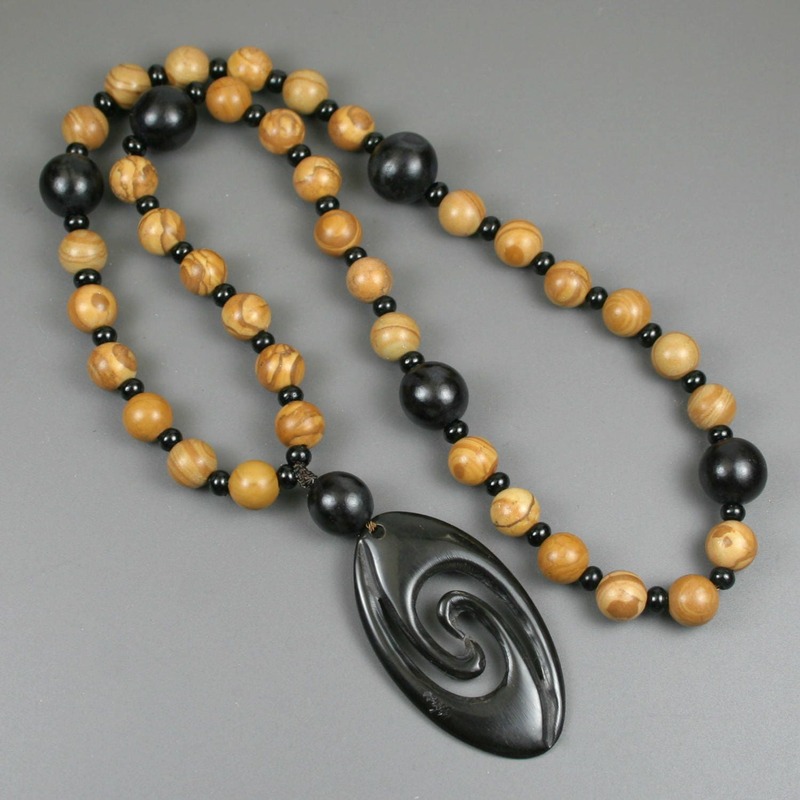 The beads have a matte finish and texture, creating an earthy appearance. Tigerskin "jasper" is known for promoting the ability to get out of one's head and back into the body. 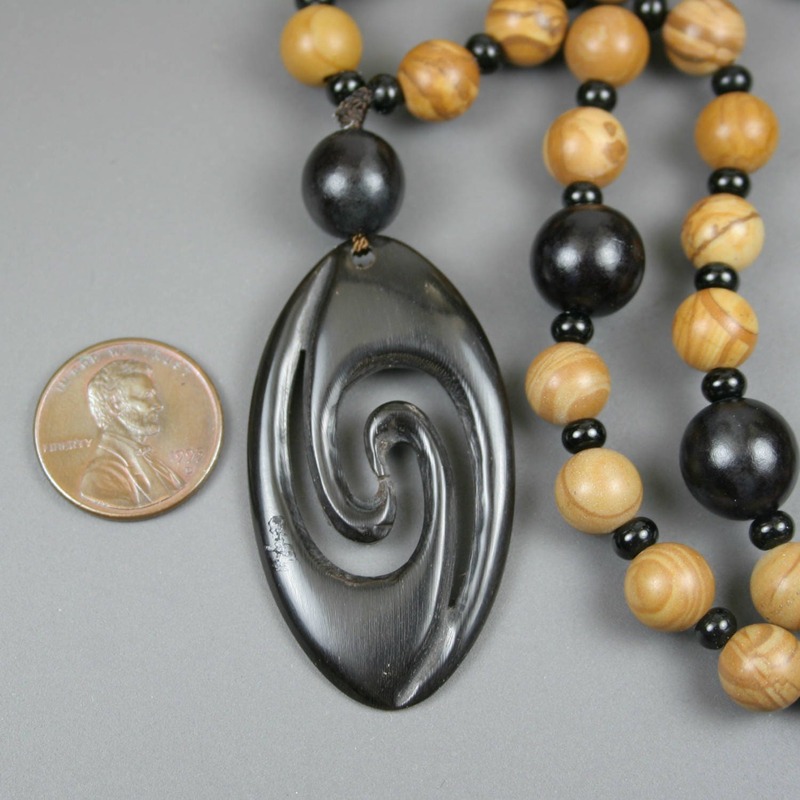 The buri root bead is a hand-carved bead from the root of the buri palm tree, which is native to India, Malaysia, Indonesia, the Philippines, New Guinea, northeastern Australia (Cape York Peninsula, Queensland), and the West Indies. 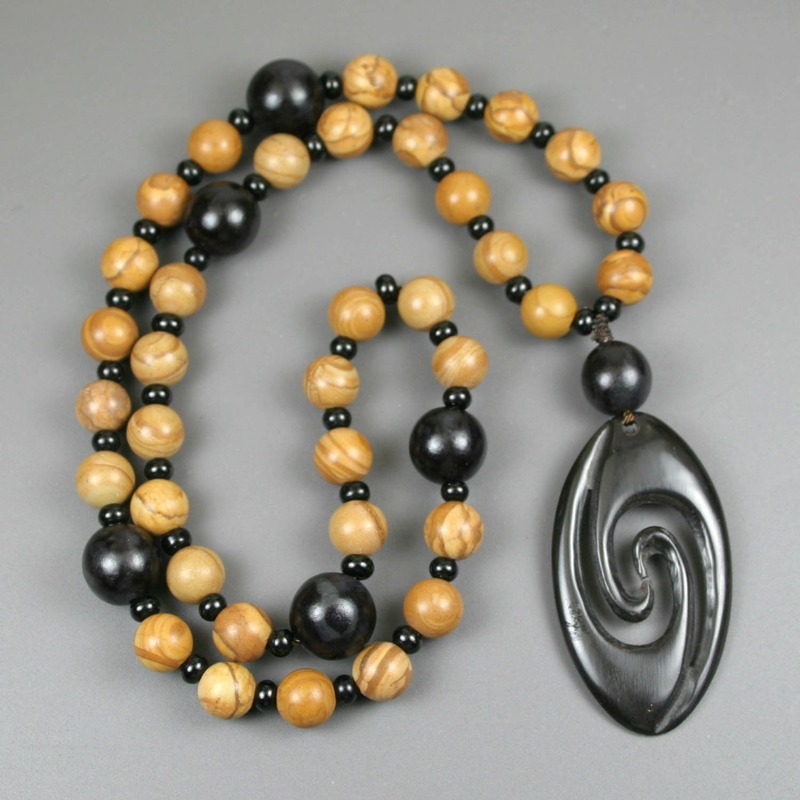 These beads can range from brown to black, but this particular specimen is a deep black.